was established in Feb. 1990 as the first floating marinas Construction Company in Egypt, sole agent for several international floating pontoons and boat Marinas manufacturers. 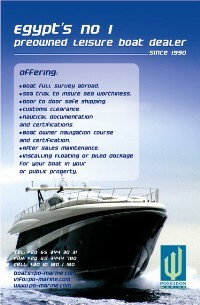 is the first general marine services and retailer in the Red Sea Egypt. is to introduce professional service under maximum safety and comfort. * Ponte Rialto Caffè, Italy - Germany. * Caruzo Caffè, Italy - Germany - Egypt. * The Candy Shop, Egypt. * Ancient Egypt Restaurant and Lounge, Sofia Bulgaria.